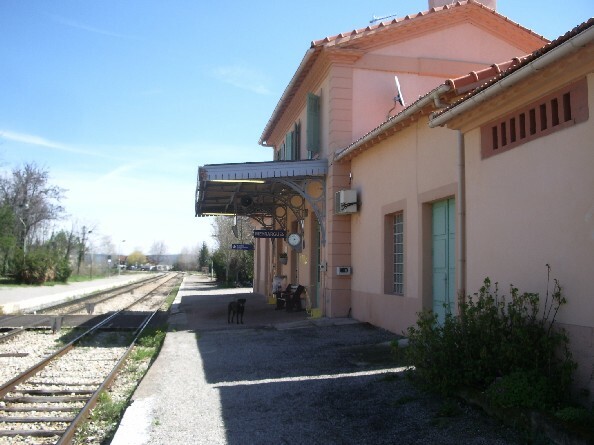 We start the last section of our journey on the Ligne de Central Var of the Chemin de Fer du Sud de la France from the station at Rians. 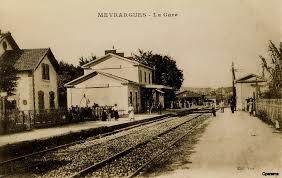 Before returning to the station we take a look round the town and its immediate environs. 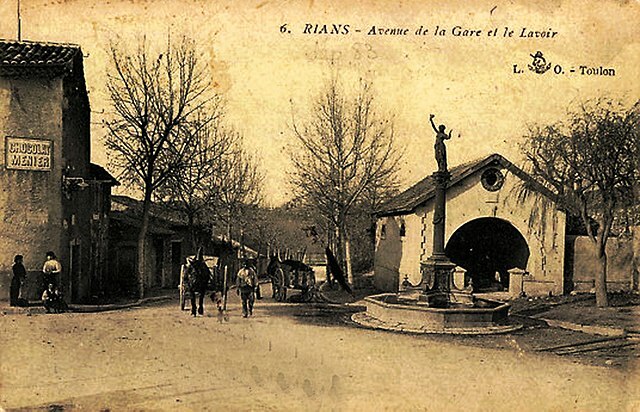 Rians is a commune in the Var department in the Provence-Alpes-Côte d’Azur region in south-eastern France. 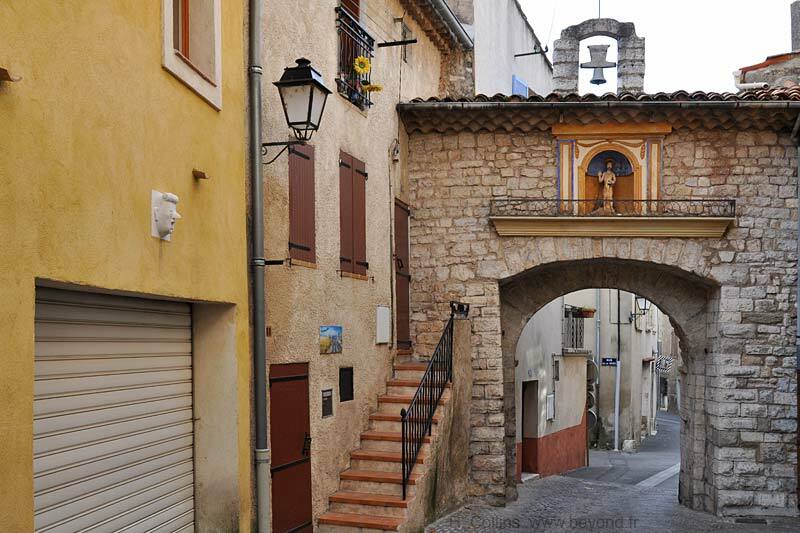 It is a provençal village in the Upper Var located north east of the Montagne Sainte-Victoire. 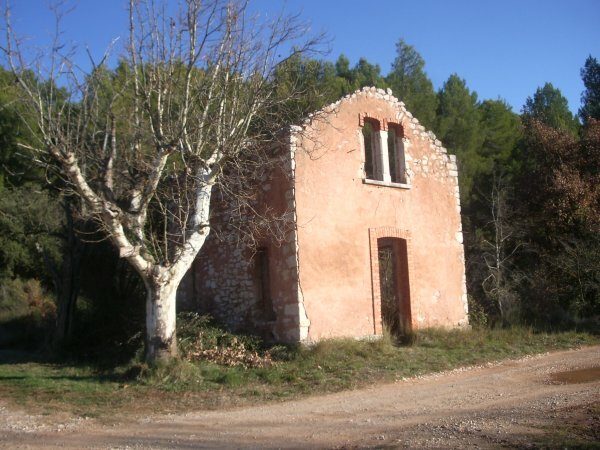 It is on a narrow farming plain between the hills north-east of Sainte-Victoire and south of the Durance/Verdon hills. The main employment is agriculture, predominantly wine. 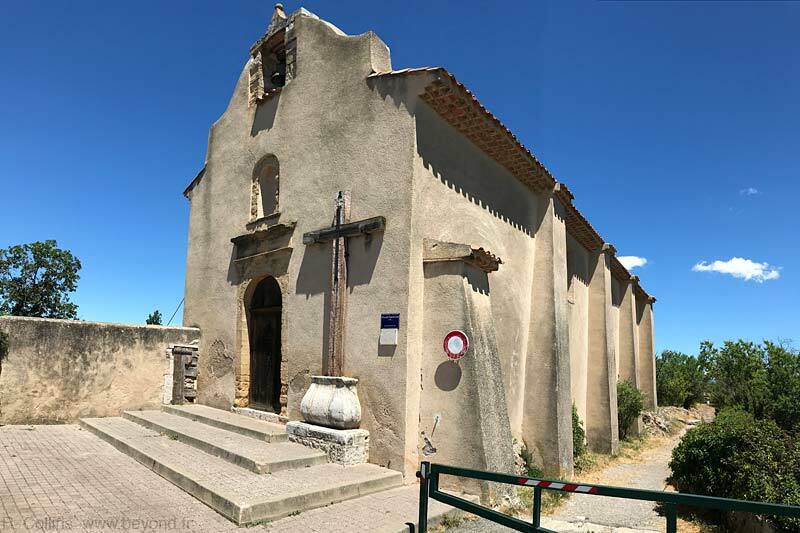 The village itself is built on a hill that is dominated by a 12th-century bell tower and the church of Notre Dame de Nazareth. 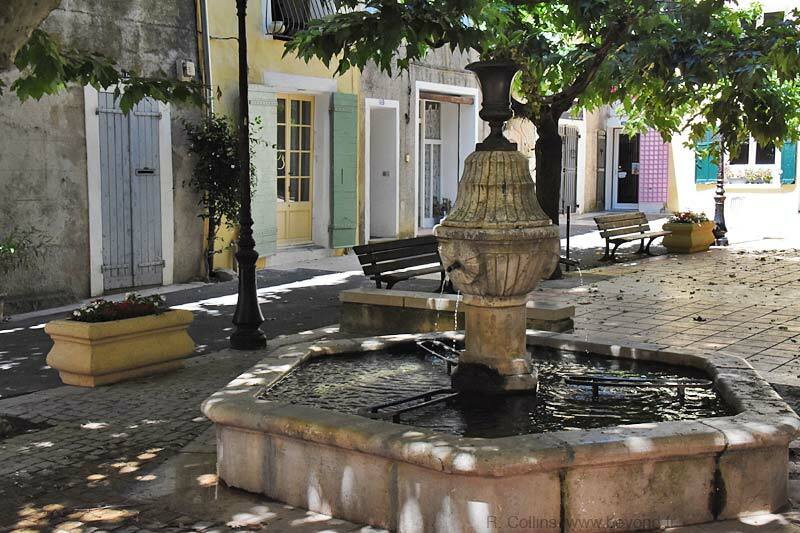 The Town is made up of concentric medieval streets that work their way down the hill. 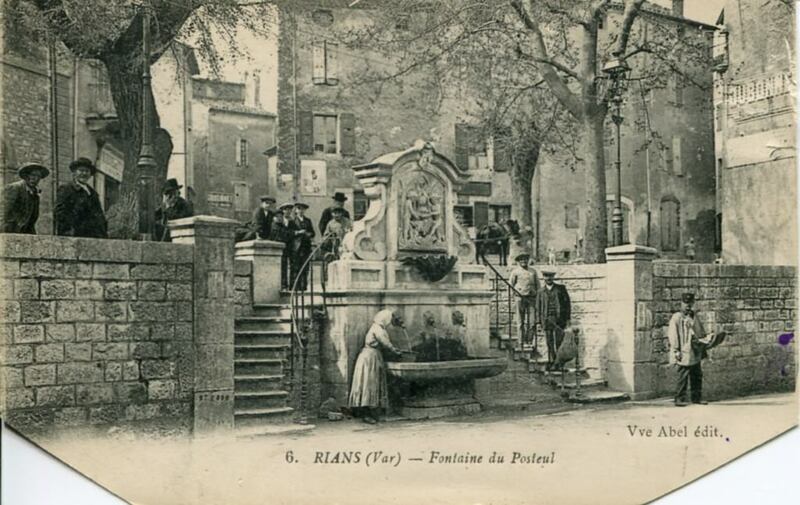 I am told that notable events in Rians include: dancing in the squares on 14th July; the Fête de St Laurent on 8th August; and the Fête de la Courge in October. We missed all these as we drove across the north side of Rians in November 2017. 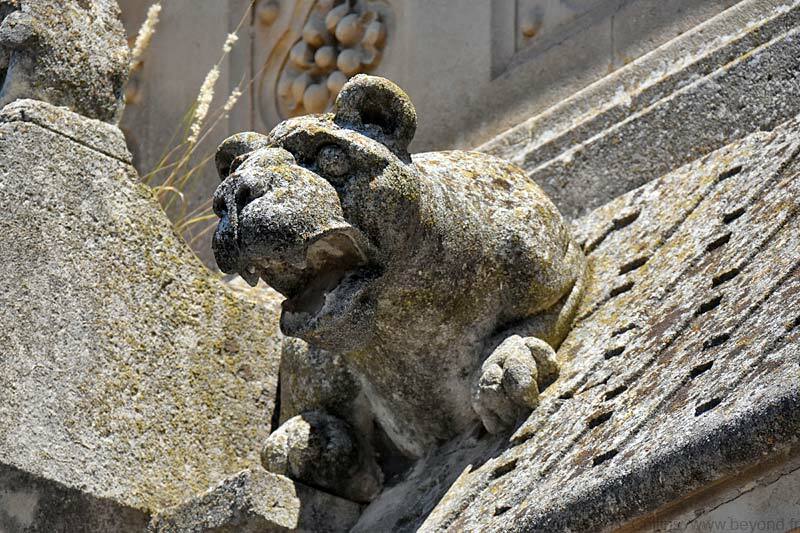 A few pictures will give us a feel for the village. 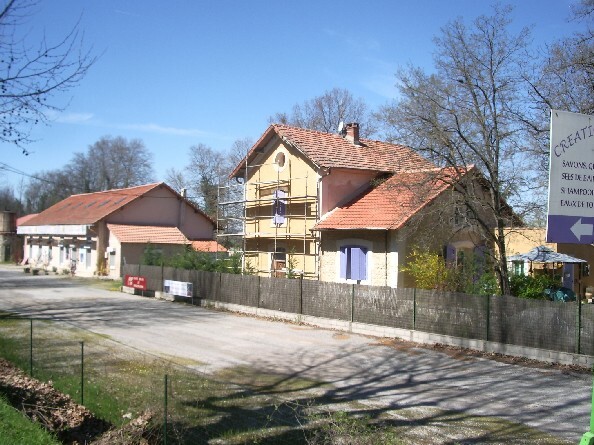 Since prehistoric times, this village has been populated. There is apparently proof that around 40,000 years ago people used to live in caves of Rigabe. 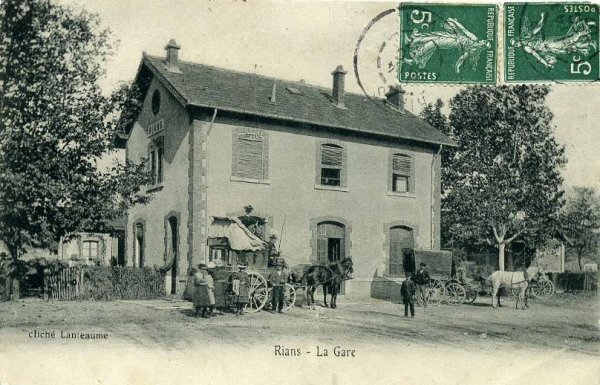 There are over 4,300 people living in Rians at present. 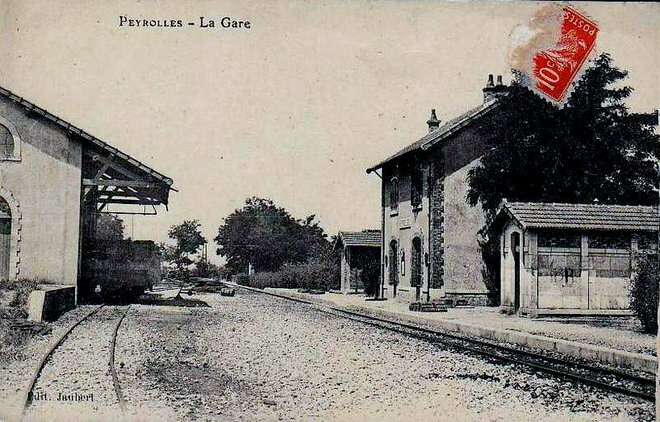 After a good look round, we head for the station up Avenue de la Gare. 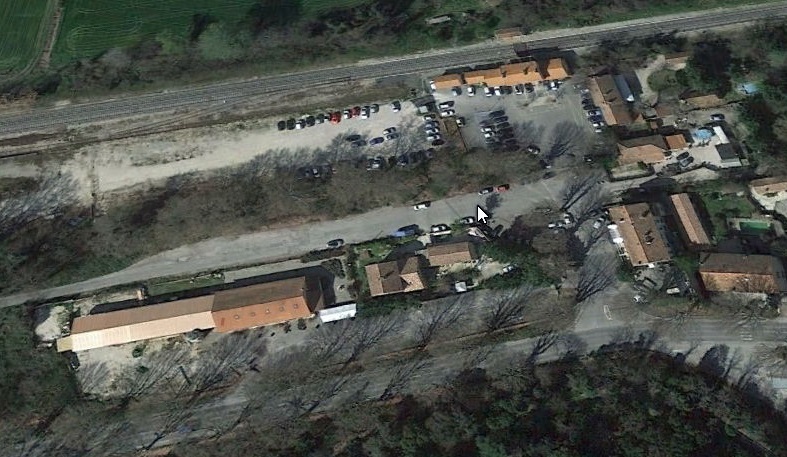 As we wait for our train we notice once again the large Wine Cooperative next to the station and comment on how much larger its warehouse is than the goods facilities at the station. 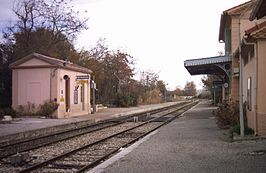 The line heads north-west from the station and curves round to a more westerly direction before crossing the Canal de Provence. 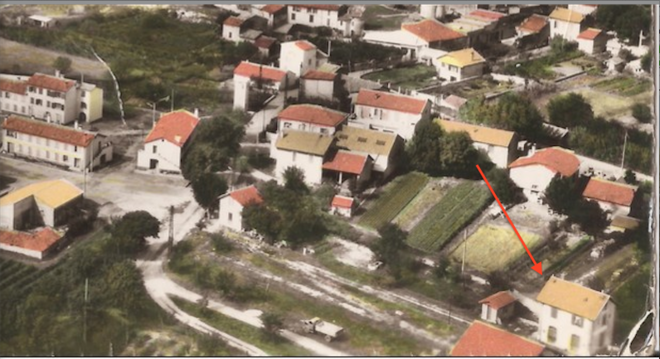 In the satellite image below the Chemin des Herbes in the bottom right is the route of the line immediately after leaving Rians Station. 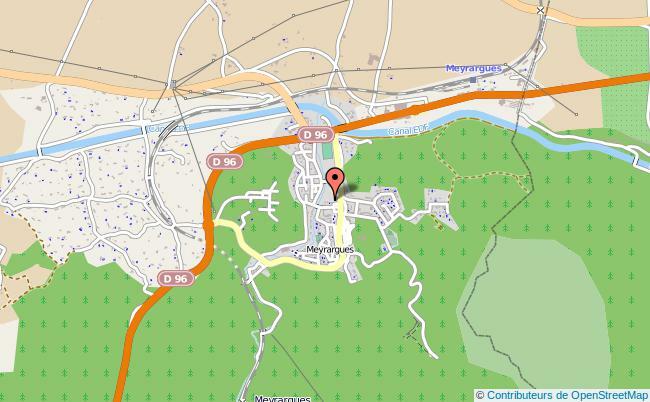 The line leaves the image centre left below the East-West arm of the Canal. 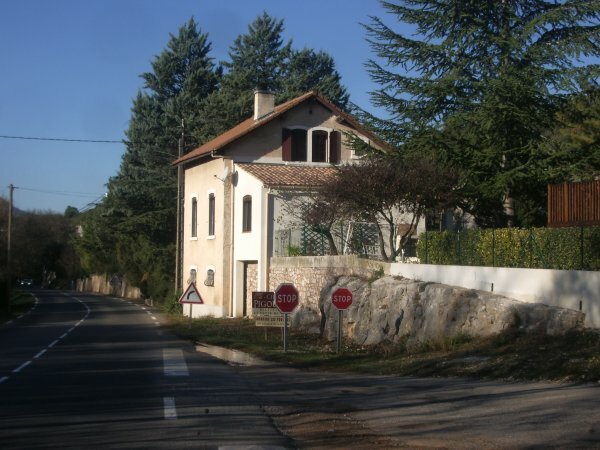 Incidentally, in November 2017, we had breakfast at a small Boulangerie on the North side of Rians – Artisan Boulanger, Lucian Amoureux. 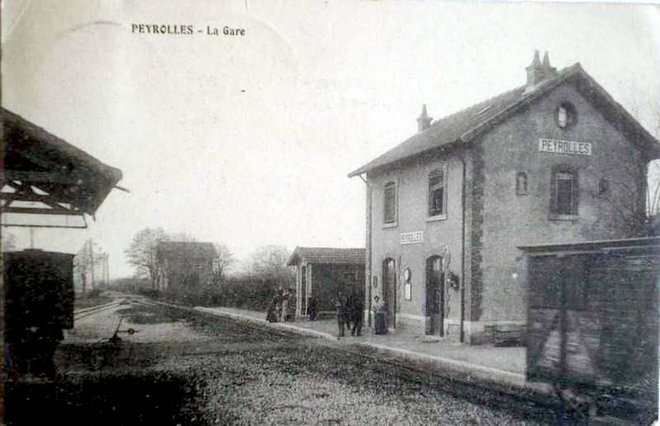 The premises are just to the South of the old line. A lovely and cheap breakfast it was too. 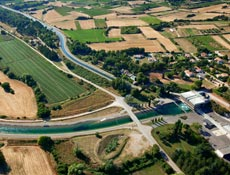 The Canal de Provence is run by SCP – La Société du Canal de Provence. 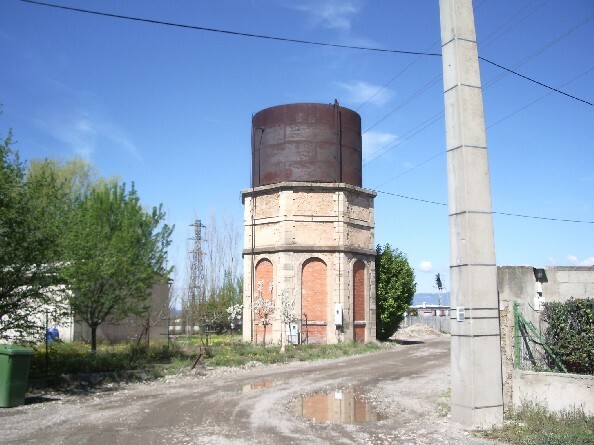 In 1957, aware that the control of water was the key to the socio-economic development of Provence, three territorial communities, the departments of Var and Bouches-du-Rhône and the City of Marseille, decided to pool their rights to the catchment around the Verdon river. 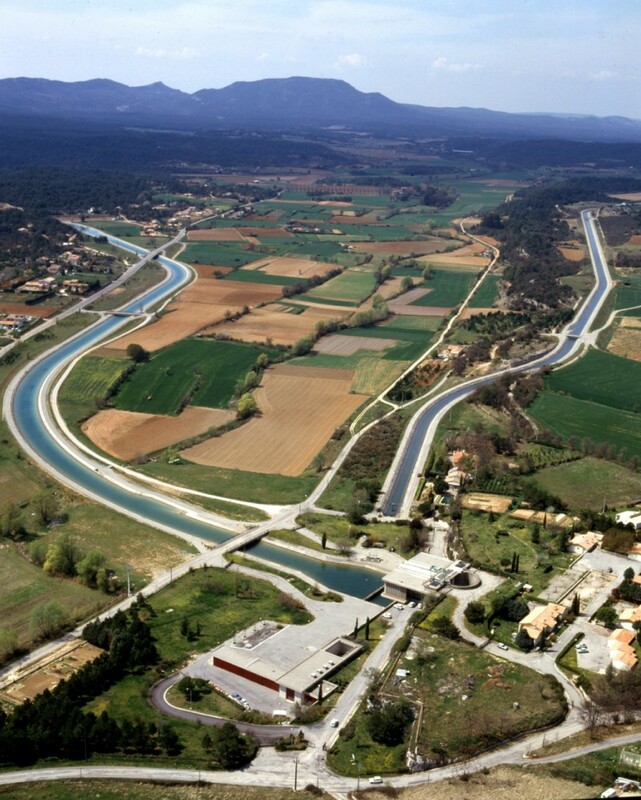 They gave the Société du Canal de Provence the task of ensuring the hydraulic development of the region. 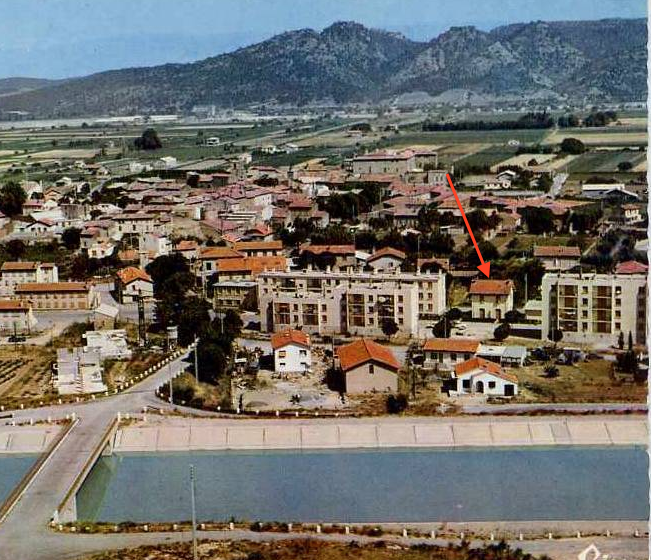 In 1963, the company was commissioned by State concession to build and manage the Canal de Provence and the other works necessary for the water supply of the Eastern and coastal areas of Provence. 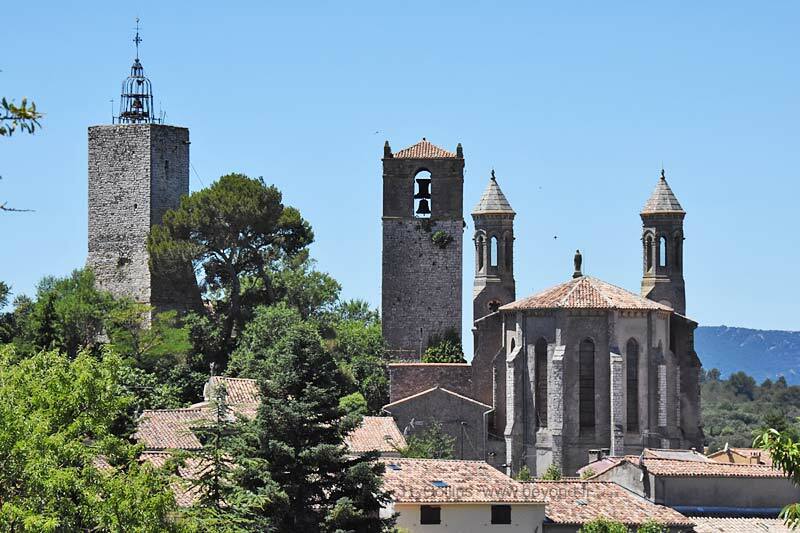 The Company has an annual turnover of 100 million euros. 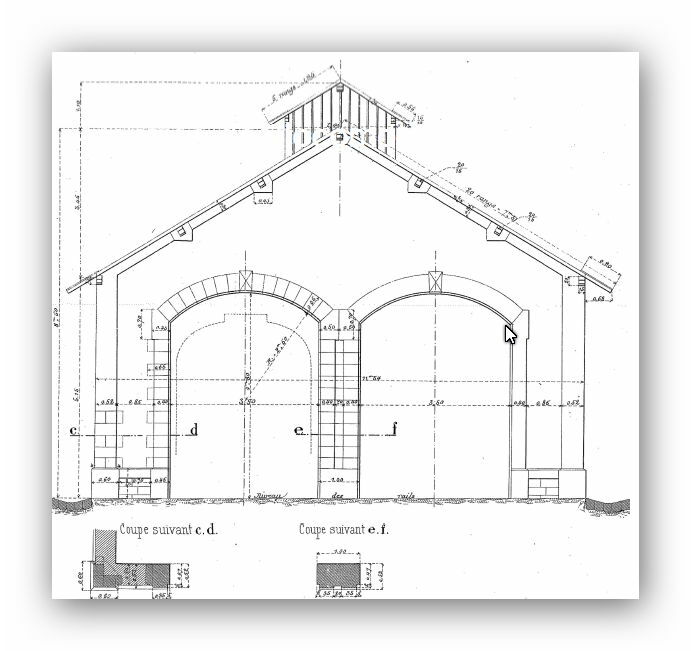 On average it invests 40 million euros each year in its infrastruture. It has 480 employees and transports 200 million cubic metres of water each year. It also produces 20 Million kWh of hydro-electric power each year. It has nearly 70 km of open channels, more than 5,000 km of water supply and distribution pipelines, 85 dams and local reservoirs, 83 pumping stations, 19 water treatment stations, 4 clarification and filtration stations, 6 mini and micro hydropower plants that produce 50% of the company’s consumption. 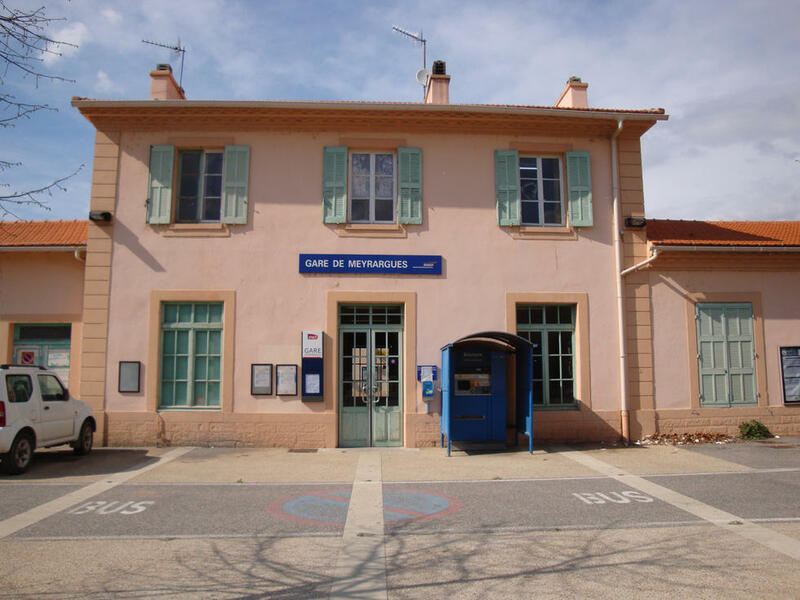 It supplies 1,700 companies, 165 municipalities, 6,000 farms, 80 000 ha equipped with irrigation, 37,000 individuals, 2,000 posts and fire stations and about 40% of the population of the entire Provence-Alpes-Côte d’Azur region. 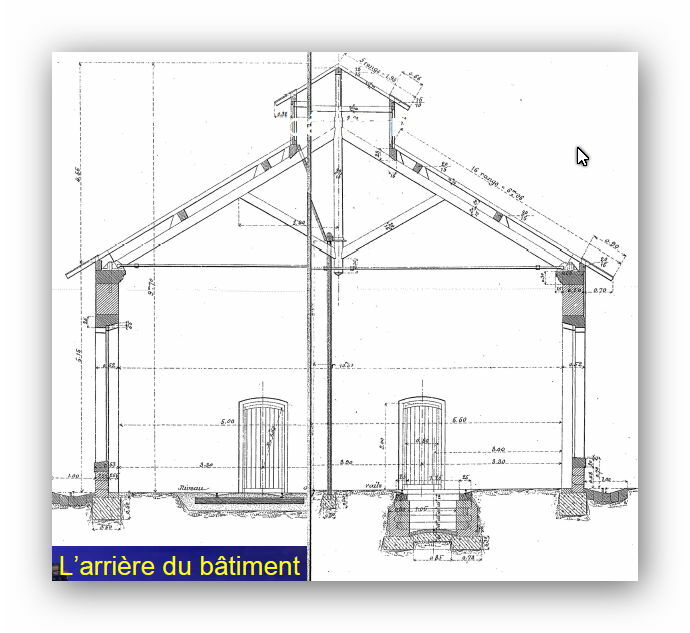 More information can be found by following this link: http://en.calameo.com/read/000326974aee7083e98b9. 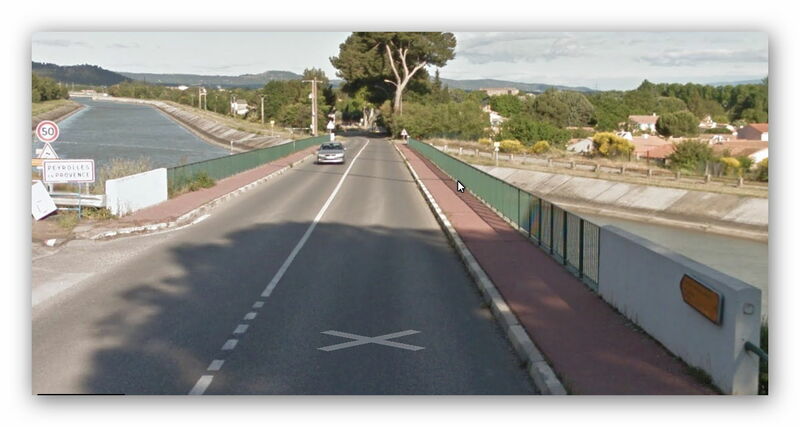 The railway line ran along the line of the road which can be seen in the picture above, crossing the large canal on a bridge and then heading off into the distance to the left (South side) of the narrower canal. 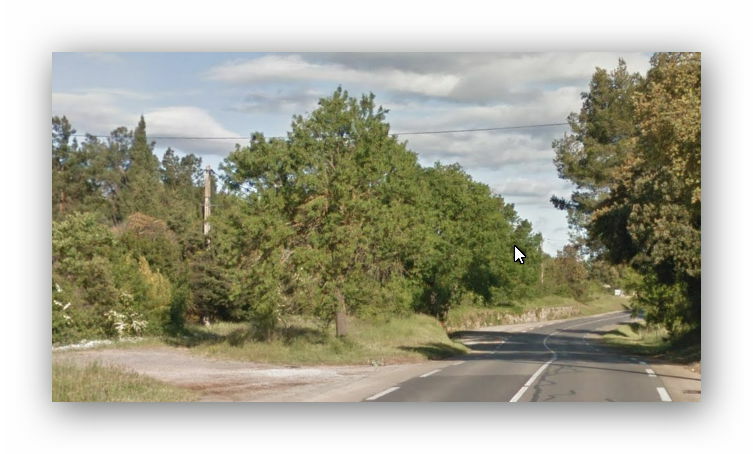 Two pictures along the route show, first, an abandonned crossing keeper’s cottage, and then a view back down the line before it reached the next halt, showing some of the significant earthworks along this length of the line. 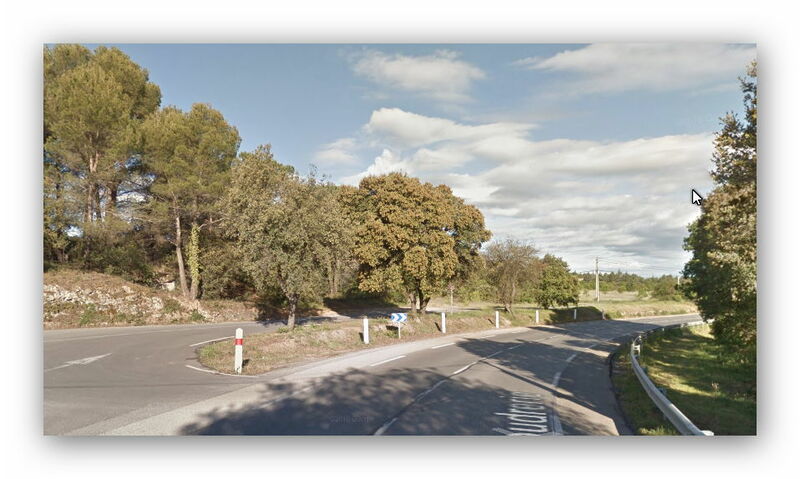 A few kilometres after crossing the canal, the rail formation meets up with the D561 road to the West of Le Benas and just to the East of the border between Var and Bouches-du-Rhone. 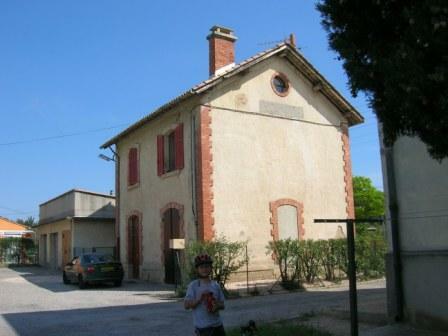 There was a small halt at this point (Roques-Port Sec) and the building remains as a private property. 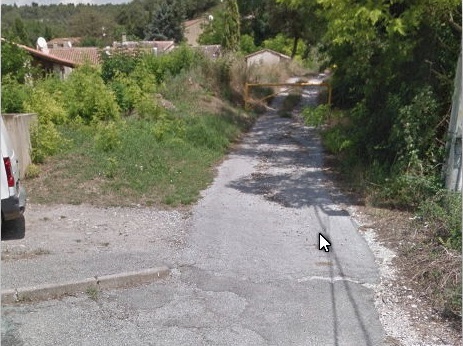 The satellite images suggest that at one time the old road was above the line of the railway, separated from it by retaining walls and at one point by a rock bluff. 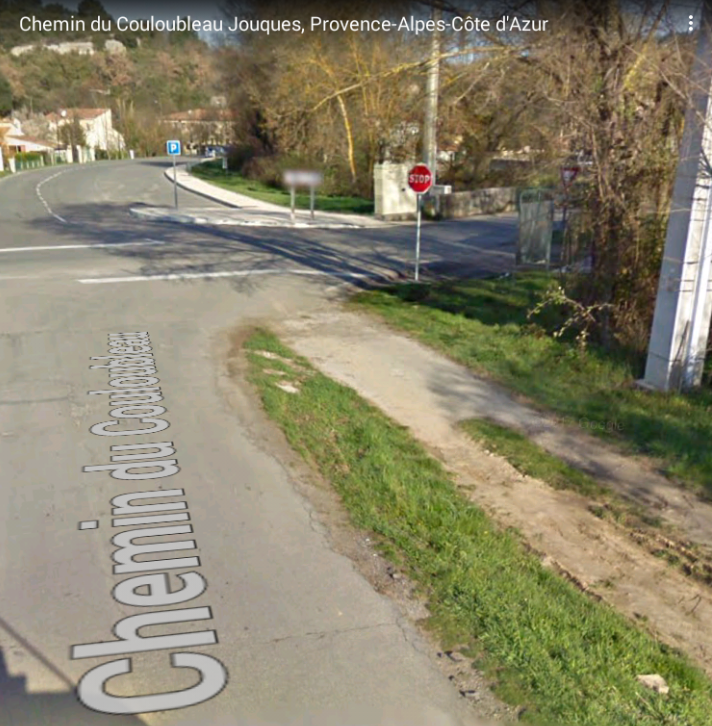 The present road has apparently been aligned with the old railway on a widened formation. Close to the border a modern aqueduct can be seen over the D561, part of a whole series of water supply arrangements run by the SCP. 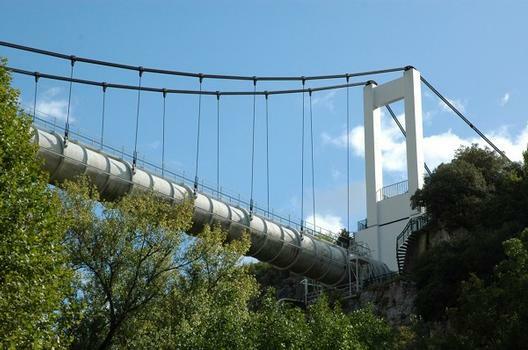 This is a suspension bridge carrying a water supply. 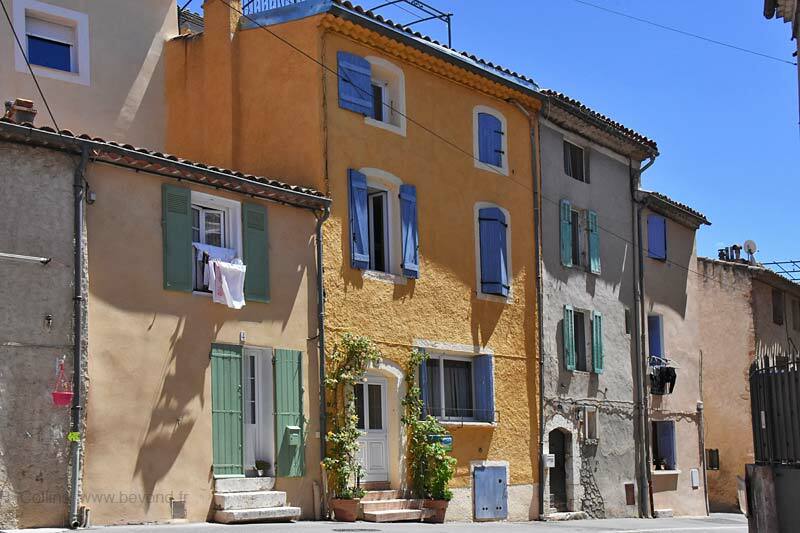 Typical of Provence is the amount spent by the Department and Region in securing a good water supply for residential, farming and business use. We move on now into Bouches-du-Rhone. Jouques is the next village on the line. 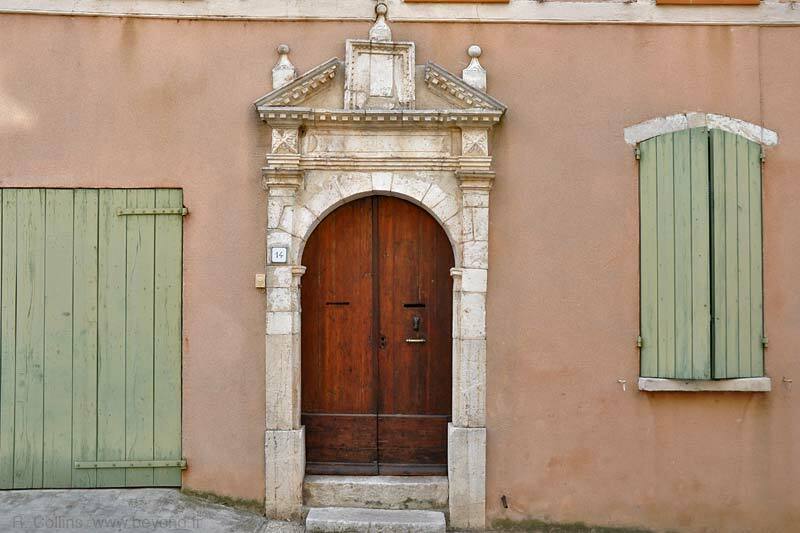 It is a small village not far from Le Durance, nestled between Provence and Luberon. 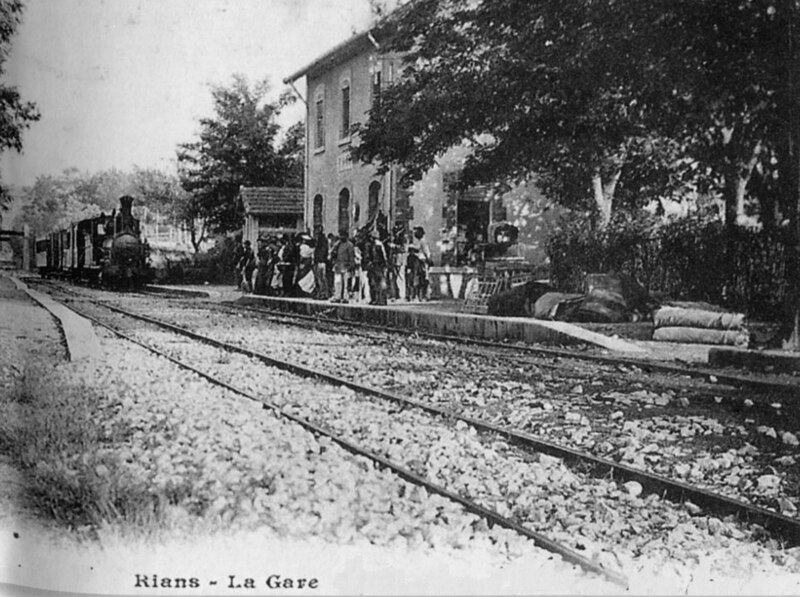 On the way to Jouques the line leaves the alignment of the D561 (while remaining on Route de Rians) and crosses the river (the Ruisseau de Saint-Bachi) and travels along on the South side of the river. 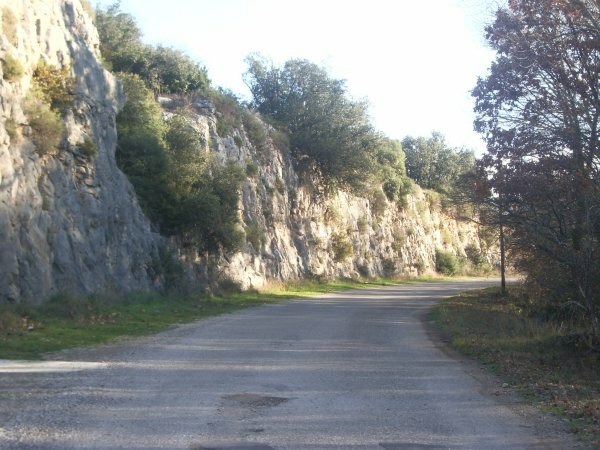 Approaching Jouques, the formation runs immediately alongside Chemin de Couloubleau. 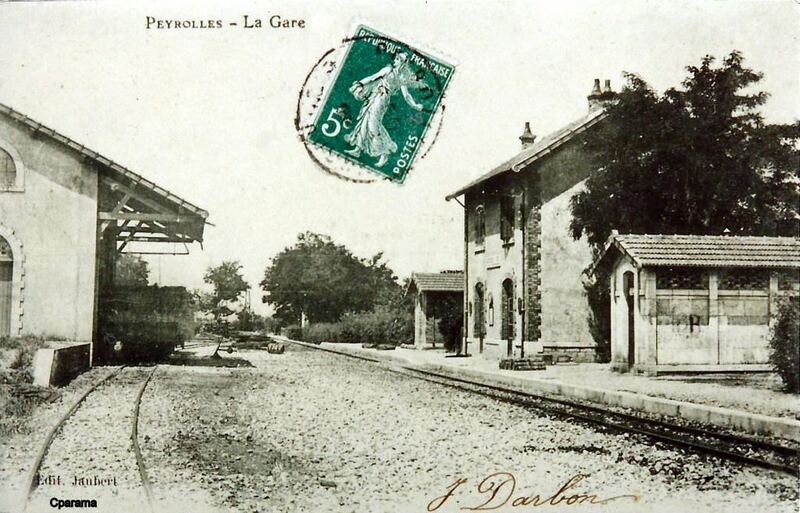 The road, as can be seen, widens out to include the railway formation and becomes Avenue de la Gare. 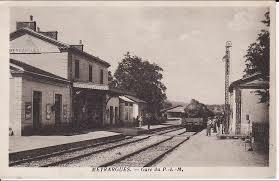 A short stop at Jouques Station and we are on our way once again. 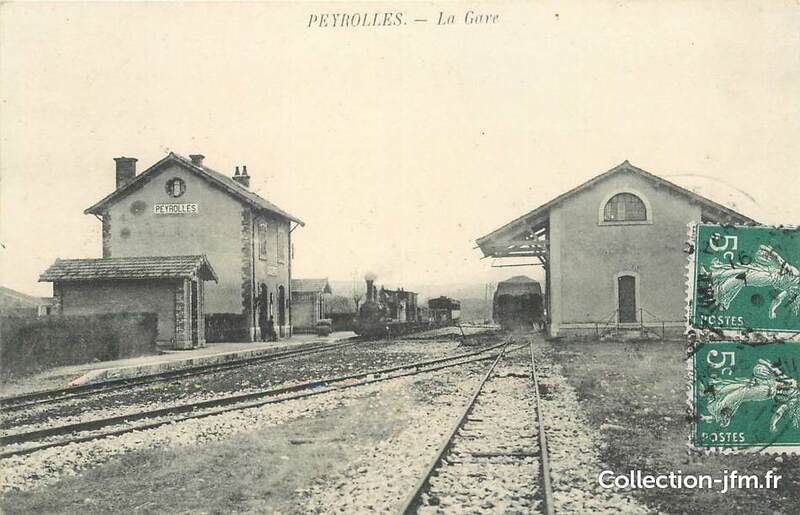 the tracks head across the yard ahead of us on the adjacent photo and then into a very short tunnel before we pick it up again on La Burlière. 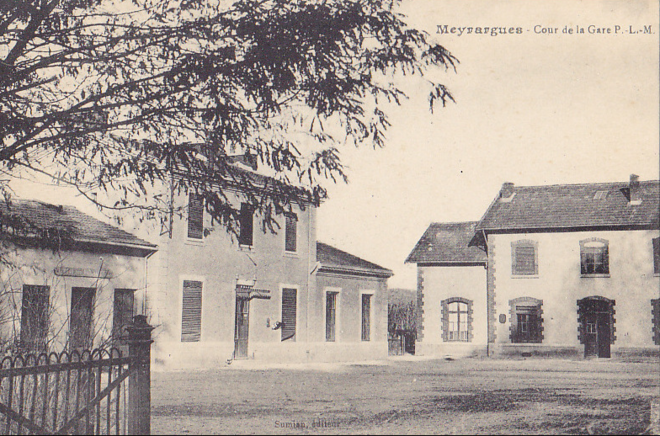 The picture below looks back down the line towards Jouques town centre. The route then finds a path alongside the D561 once again as it leave Jouques behind. 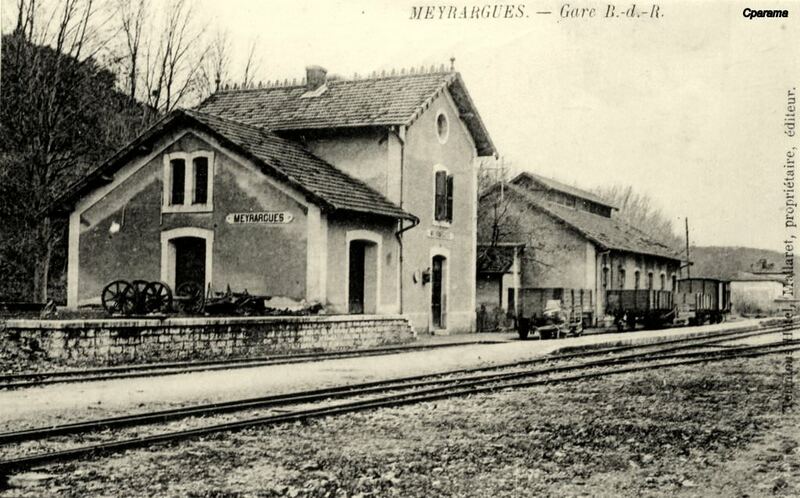 The trains followed tracks aligned roughly with the cycleway/footway on the left of the photograph. 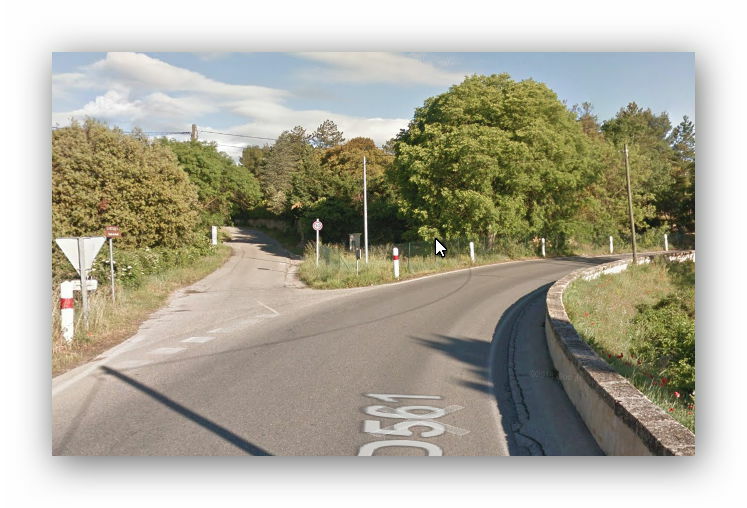 At various points along the D561 its route can be picked out, either directly alonside the carriageway or deviating away from it. 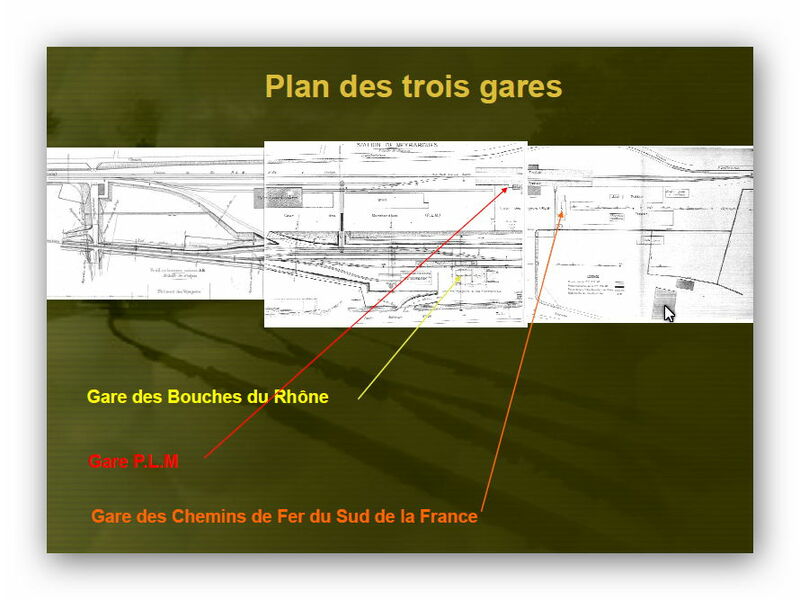 The line continued to what is now a major canal aligned with the present D561 road bridge – Pont EDF. 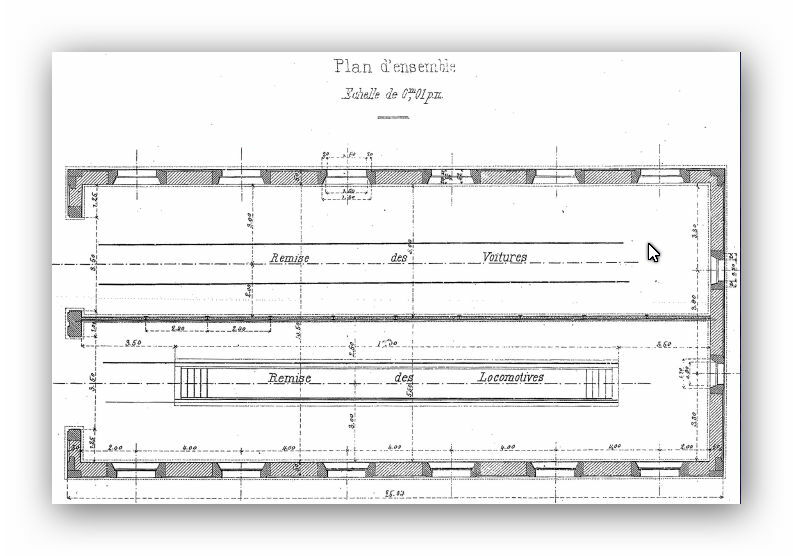 When the railway was in use this canal did not exist. 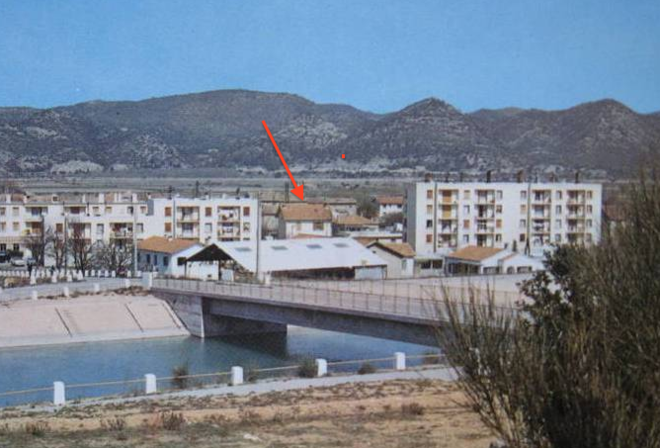 It was built in the 1960s. The formation seems to have been obliterated by the canal works. 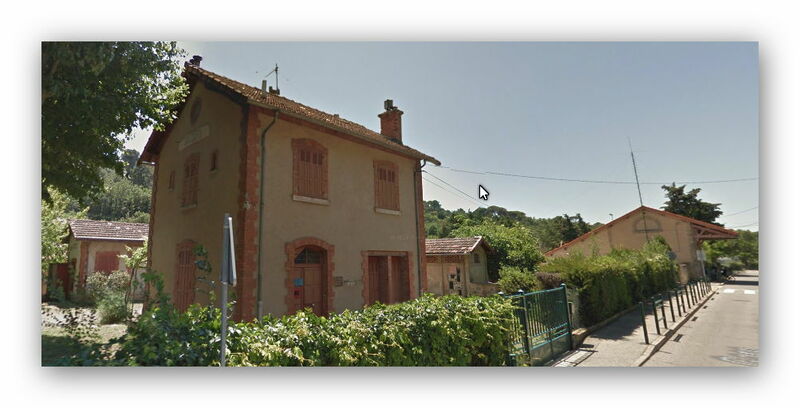 It does not follow the alignment suggested in the file associated with Google Earth as we can identify the station building somewhat to the South of that line, much closer to the canal. 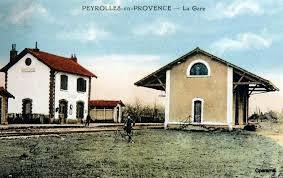 It appears that the line followed the route of the canal for a few hundred metres before deviating into Peyrolles. 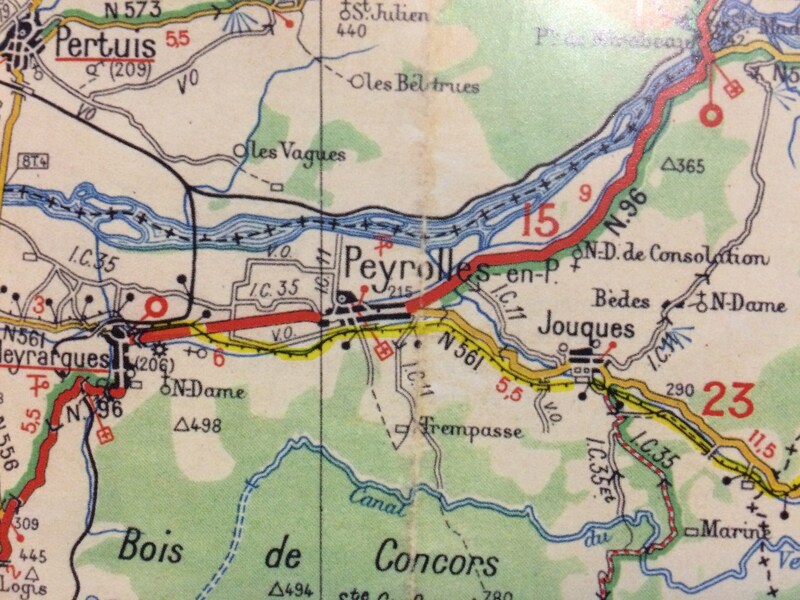 The exact line is difficult to decipher, however, the 1934 Michelin map shows the line a good distance below the N96 (now D96) and the N561 (now D561) roads as they meet East of the centre of Peyrolles. 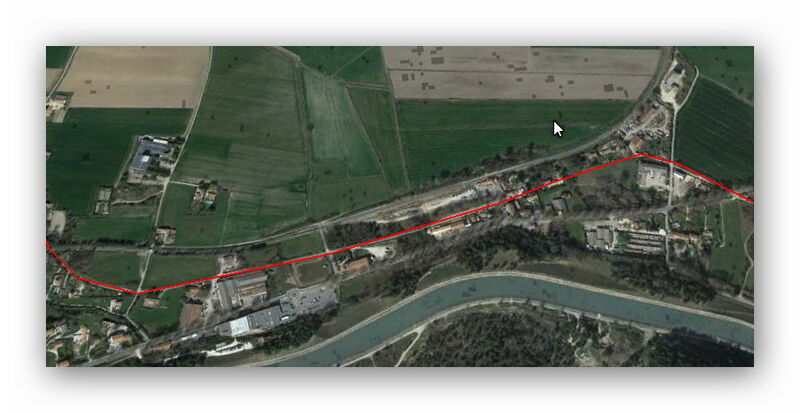 The red line on the satellite image above is the route of the line as indicated on the add-in to Google Earth. 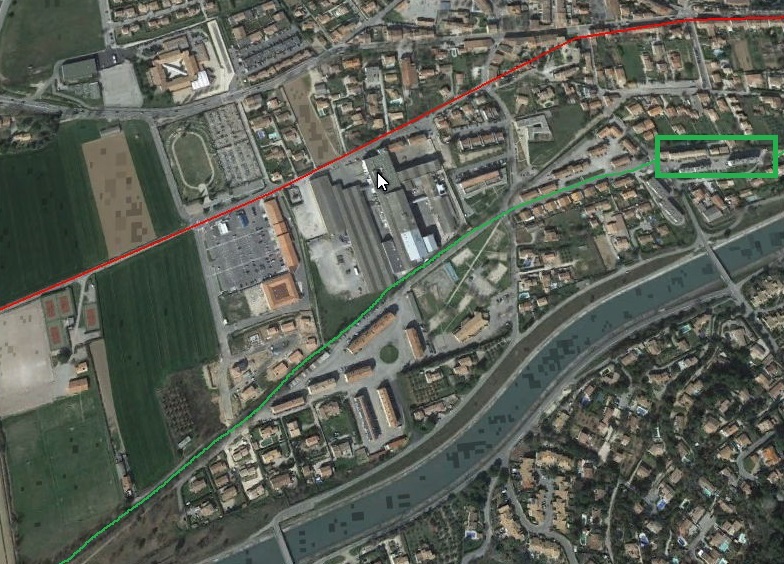 The green-line is the much more likely route and the green box highlights the location of Peyrolles Station. Leaving the station the route curves round to the South West, tightly following the line of a smaller older canal (Canal de Peyrolles) which runs on the North-side of the modern canal. The green line approximates to the route on the image below. 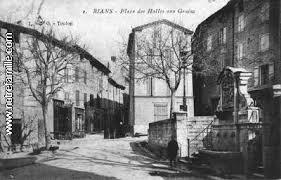 It follows what is now called Boulevard Courdeloi before crossing the Canal de Peyrolles to join the Route du Plan. 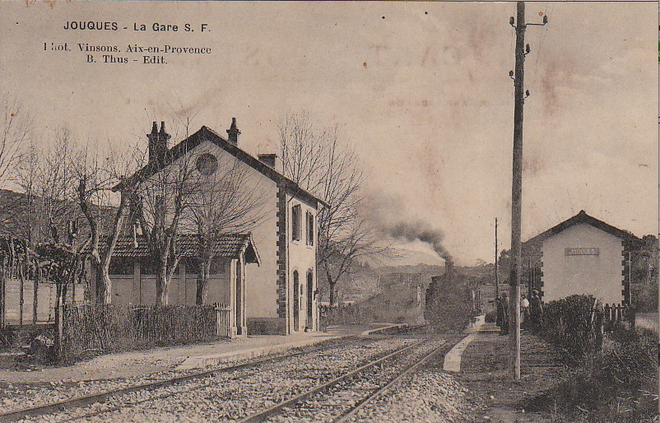 The Route de Plan and the rail alignment cross the D96 at level and the road name changes to La Grange. 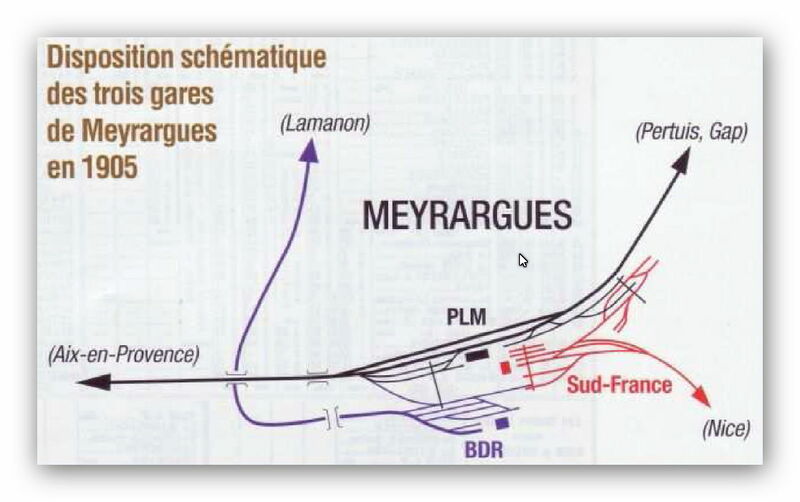 The alignment then turns to a more Westerly rather than North-westerly direction and runs parallel to the old PLM line towards Meyrargues. 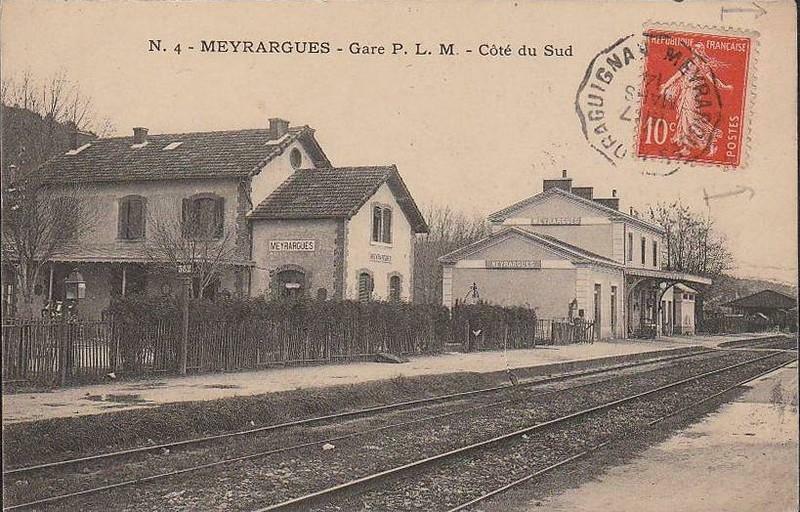 The red line below seems to travel passed the station an on along another railway. More about this below. The three satellite images show the shared location of stations on three different railway lines. 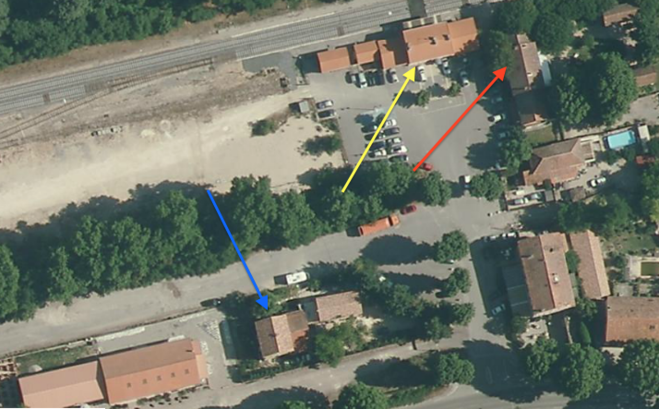 The most northerly station marked on the final satellite image in yellow is the PLM Station on the old line between Paris and Marseilles. 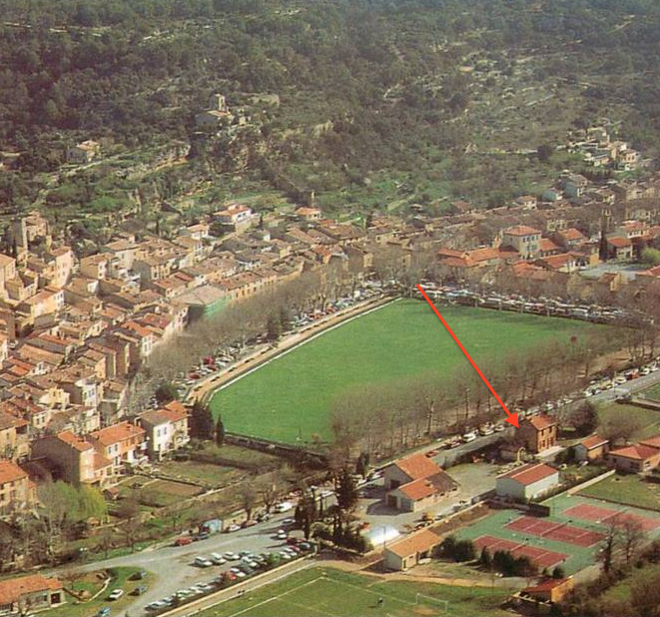 The red arrow points to the passenger station buildings of the terminus of the Chemin de Fer du Sud de la France Central-Var line. 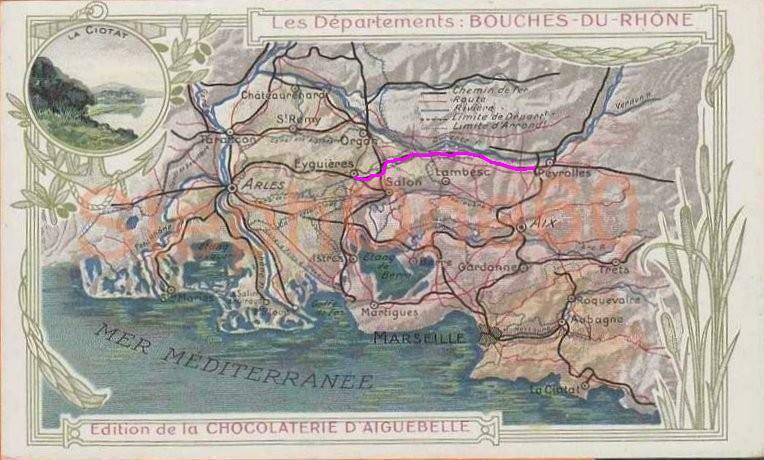 The blue arrow points to the passenger facilities of the terminus of the standard gauge line to Salon-de-Provence and Arles which was run by the department of Bouches-du-Rhône. 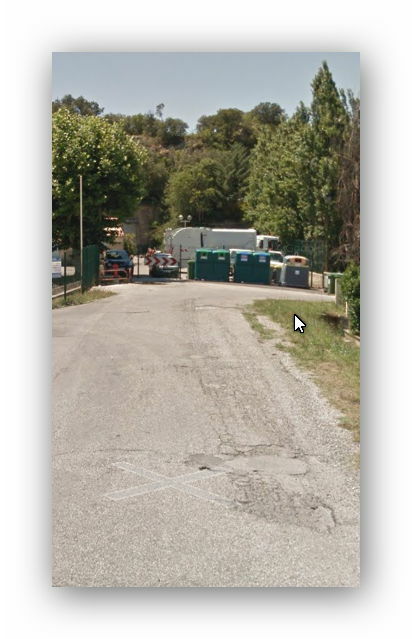 It is this third line which has been picked out by the red line through the station site on the first satellite image immediately above and following this third line is a story for another occasion. 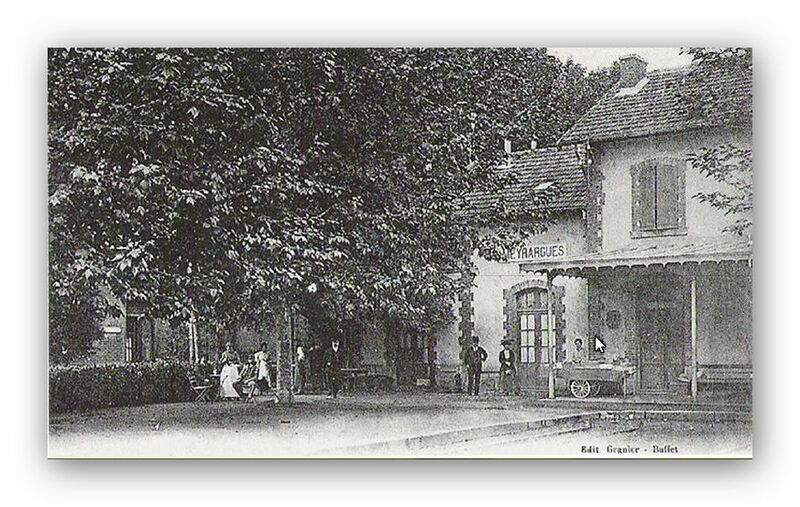 This station was constructed in the 1850s and remains open today. 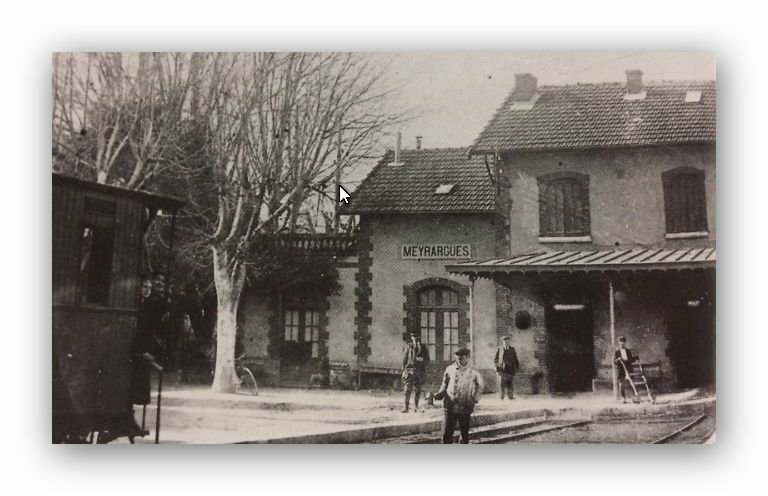 The PLM line circled round the West side of Meyrargues and entered a short tunnel before reappearing to the South-east of the town. 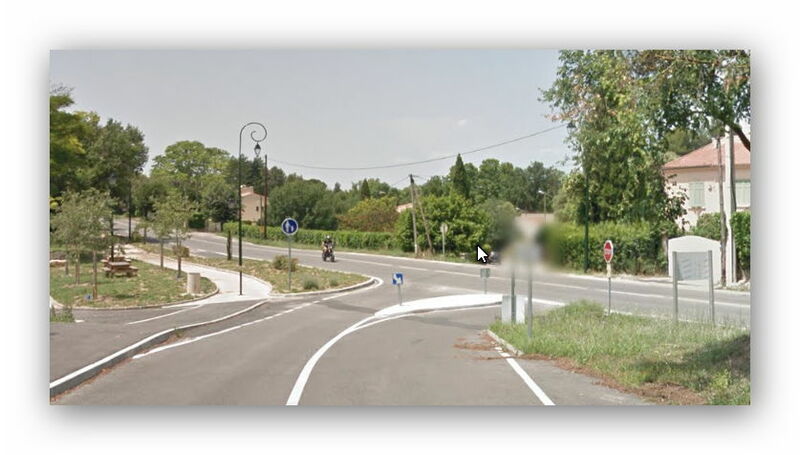 The alignment can be seen on the map at the end of the next sequence of photos. 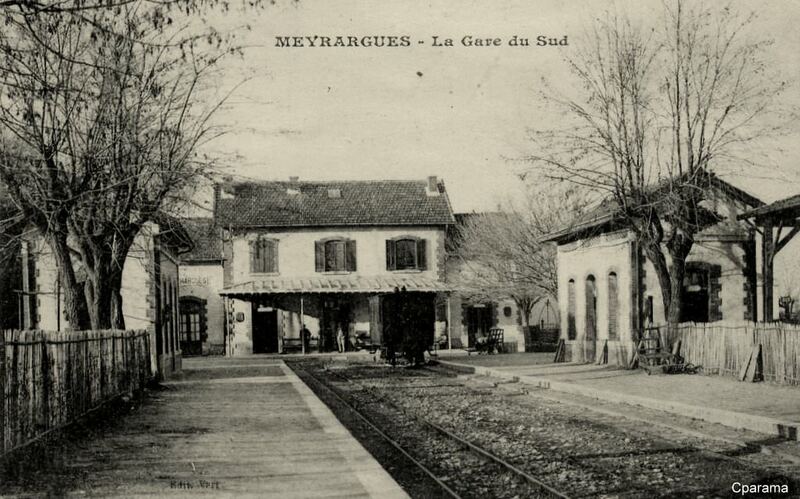 Once clear of Meyrargures the line travelled south to Marseilles. 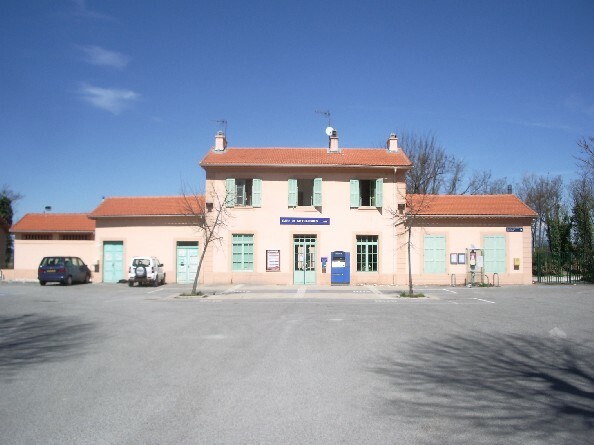 The good shed visible beyond the passenger station building is now in use as a perfumery and they have kept records of the drawings of the building. 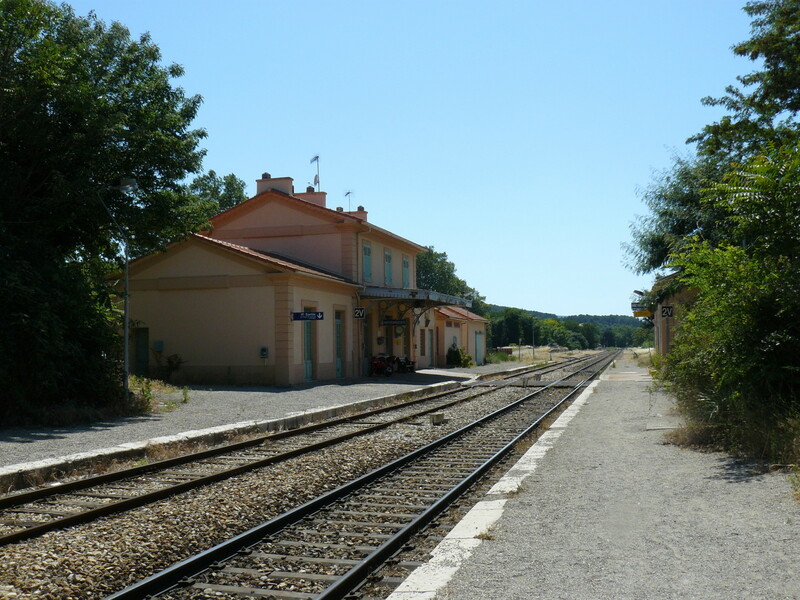 Our journey terminates in this station. 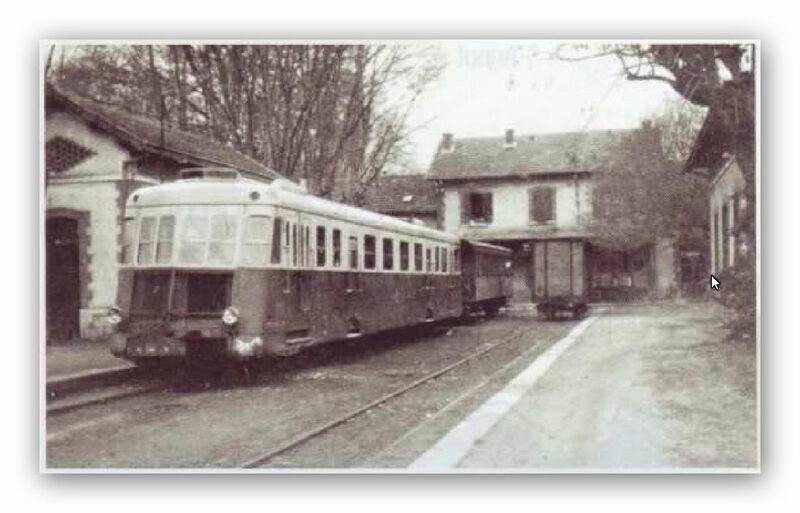 There is just time top provide you with the timetable if you want to make the return journey along the line. 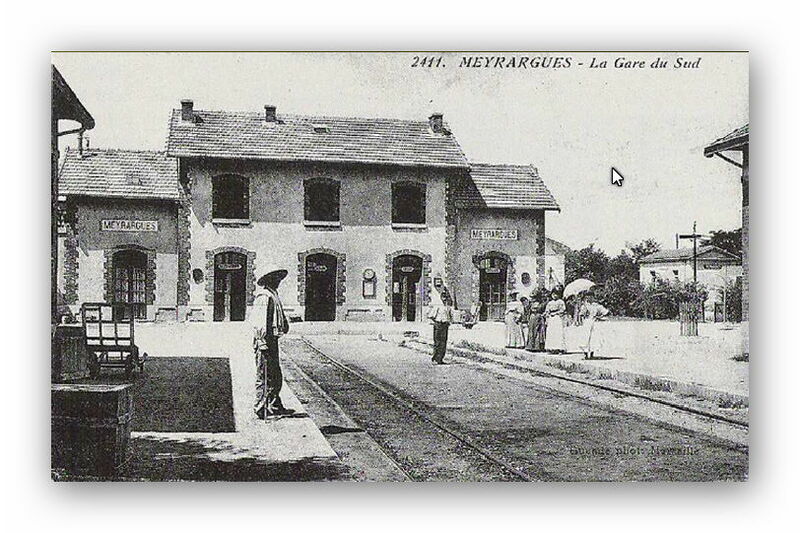 This entry was posted in Railways and Tramways Around Nice, Railways Blog on December 11, 2017 by rogerfarnworth.